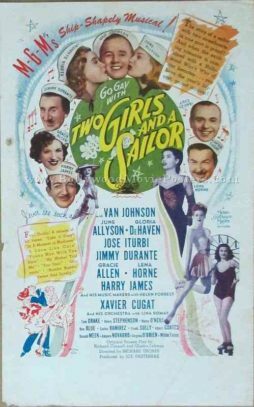 Very rare old handbill of the Hollywood movie, Two Girls and a Sailor (1944) for sale. Printed and circulated during the original first release run of the film in India (1940s), this vintage handbill for sale was actually distributed outside a cinema hall that screened the film and was possibly used as a flyer insert in local newspapers. This old movie handbill features photographic artwork and was designed and printed for the promotion of the film at an Indian theater where it was screened. This old movie handbill has been graded ★ As Is due to small chips on the bottom edges. There is no other damage to the paper and it is in excellent display condition overall. 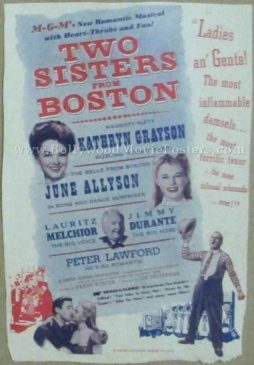 Very rare old handbill of the Hollywood movie, Two Sisters from Boston (1946) for sale. This is an actual surviving original vintage handbill of the 1946 musical comedy film that starred Kathryn Grayson and June Allyson in lead roles. Printed and circulated during the original first release run of the film in India (1940s), this vintage handbill for sale was actually distributed outside a cinema hall that screened the film and possibly used as a flyer insert in local newspapers. 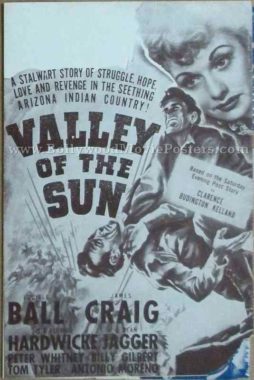 Very rare old handbill of the Hollywood movie, Valley of the Sun (1942 ) for sale. This is an actual surviving original vintage handbill of the 1942 film that starred Lucille Ball and James Craig in lead roles. Printed and circulated during the original first release run of the film in India (1942), this vintage handbill for sale was actually distributed outside a cinema hall that screened the film and possibly used as a flyer insert in local newspapers. This old movie handbill features photographic artwork and was designed and printed for the promotion of the film at an Indian theater (Capitol), where it was screened. The exact dates of release of the film (October 1942) are printed on the reverse side of this old movie handbill. This old movie handbill has been graded ★ As Is due to a small missing piece on the bottom corner. There is no other damage to the paper and it is in excellent display condition overall. 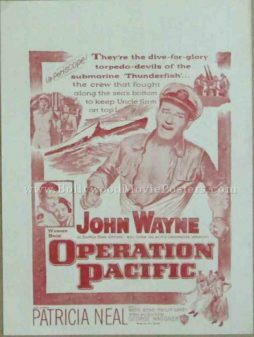 Very rare old handbill of the Hollywood movie, Operation Pacific (1951) for sale. This is an actual surviving original vintage handbill of the 1951 World War II film that starred John Wayne and Patricia Neal in lead roles. Printed and circulated during the original first release run of the film in India (1952), this vintage handbill for sale was actually distributed outside a cinema hall that screened the film and possibly used as a flyer insert in local newspapers. This old movie handbill features photographic artwork. It was designed and printed for the promotion of the film at a prominent Indian theater (New Empire), where it was screened. The exact dates of release of the film (February 1952) are printed on the reverse side of this old movie handbill. The reverse side also contains teaser ads for upcoming films due to be screened in other theaters in the month of February (1952). 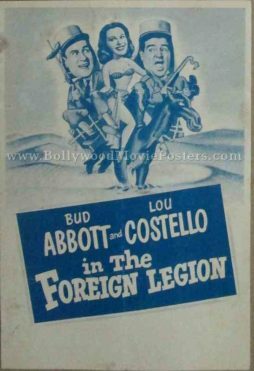 Very rare old handbill of the Hollywood movie, Abbott and Costello in the Foreign Legion (1950) for sale. This is an actual surviving original vintage handbill of the 1950 comedy that starred the hit duo Bud Abbott and Lou Costello in lead roles. Printed and circulated during the original first release run of the film in India (1951), this vintage handbill for sale was actually distributed outside a cinema hall that screened the film and possibly used as a flyer insert in local newspapers. This old movie handbill features a combination of hand painted and photographic artwork. It was designed and printed for the promotion of the film at a prominent Indian theater (West End), where it was screened. The exact dates of release of the film (March 1951) are printed on the reverse side of this old movie handbill. The reverse side also contains teaser ads for upcoming films due to be screened in other theaters in the month of March (1951). 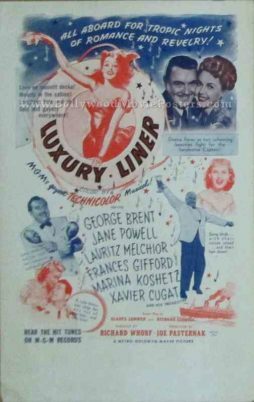 Very rare old handbill of the Hollywood movie, Luxury Liner (1948) for sale. This is an actual surviving original vintage handbill of the 1948 musical comedy that starred George Brent and Jane Powell in lead roles. Printed and circulated during the original first release run of the film in India (1949), this vintage handbill for sale was actually distributed outside a cinema hall that screened the film and possibly used as a flyer insert in local newspapers. This old movie handbill features photographic artwork. It was designed and printed for the promotion of the film at a prominent Indian theater (West End), where it was screened. The exact dates of release of the film (August 1949) are printed on the reverse side of this old movie handbill. The reverse side also contains teaser ads for upcoming films due to be screened in two other theaters in the month of August (1949). 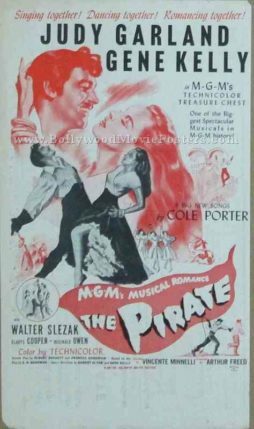 Very rare old handbill of the Hollywood movie, The Pirate (1948) for sale. This is an actual surviving original vintage handbill of the 1948 musical film that starred Judy Garland and Gene Kelly in lead roles. This old movie handbill features a combination of photographic and hand painted artwork. It was designed and printed for the promotion of the film at a prominent Indian theater (New Empire), where it was screened. The exact dates of release of the film (September1949) are printed on the reverse side of this old movie handbill. The reverse side also contains teaser ads for upcoming films due to be screened in two other theaters in the month of September (1949). 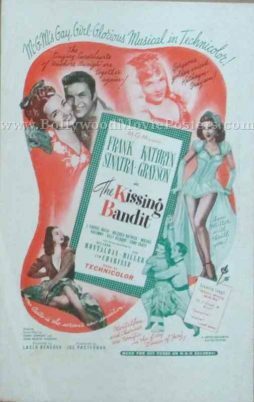 Very rare old handbill of the Hollywood movie, The Kissing Bandit (1948) for sale. This is an actual surviving original vintage handbill of the 1948 film that starred Frank Sinatra in the lead role. Printed and circulated during the original first release run of the film in India (1950), this vintage handbill for sale was actually distributed outside a cinema hall that screened the film and possibly used as a flyer insert in local newspapers. This old movie handbill features a combination of photographic and hand painted artwork. It was designed and printed for the promotion of the film at an Indian theater (Western India Theaters Limited Poona), where it was screened. The exact dates of release of the film (May 1950) are printed on the reverse side of this old movie handbill. The reverse side also contains teaser ads for upcoming films due to be screened in the theater in the month of May (1950). Very rare old handbill of the Hollywood movie, The Verdict (1946 ) for sale. This is an actual surviving original vintage handbill of the 1946 mystery drama that starred Sydney Greenstreet and Peter Lorre. This old movie handbill was printed a month before India received its independence, making it very collectible! Printed and circulated during the original first release run of the film in India (1947), this vintage handbill for sale was actually distributed outside a cinema hall that screened the film and possibly used as a flyer insert in local newspapers. This old movie handbill features photographic artwork and was designed and printed for the promotion of the film at an Indian theater (Western India Theaters Limited Poona), where it was screened. The exact dates of release of the film (July 1947) are printed on the reverse side of this old movie handbill. The reverse side also contains teaser ads for upcoming films scheduled to be screened at the cinema hall in the month of July (1947). This old movie handbill has been graded ★ As Is due to small chips on the top corners. There is no other damage to the paper and it is in excellent display condition overall. 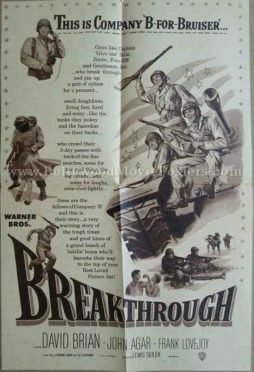 Very rare old handbill of the hit Hollywood movie, Breakthrough (1950) for sale. This is an actual surviving original vintage handbill of the 1950 war film that contained actual portions of preexisting footage shot during World War II. This old movie handbill features hand painted artwork and was designed and printed for the promotion of the film at an Indian theater (Western India Theaters Limited Poona), where it was screened. The exact dates of release of the film (Janurary 1952) are printed on the reverse side of this old movie handbill. The reverse side also contains teaser ads for upcoming films scheduled to be screened at the cinema hall in the month of January (1952). 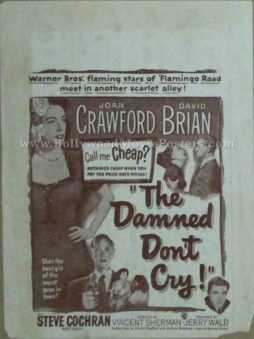 Very rare old handbill of the hit Hollywood movie, The Damned Don't Cry! (1950) for sale. This is an actual surviving original vintage handbill of the 1950 drama that starred Joan Crawford in the lead role. This old movie handbill features photographic artwork and was designed and printed for the promotion of the film at an Indian theater (Western India Theaters Limited Poona), where it was screened. The exact dates of release of the film (October 1951) are printed on the reverse side of this old movie handbill. The reverse side also contains teaser ads for upcoming films scheduled to be screened at the cinema hall in the month of October (1951). This old movie handbill has been graded ★ As Is due to a small chip on the bottom border as seen in the photograph. Barring this minor wear, there is no other damage to the paper and it is overall in excellent display condition. 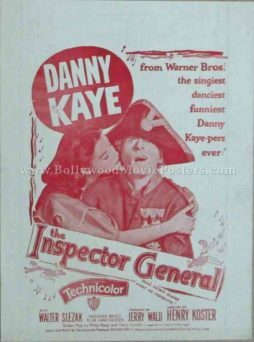 Very rare old handbill of the hit Hollywood movie, The Inspector General (1949) for sale. This is an actual surviving original vintage handbill of the 1949 musical comedy that starred Danny Kaye in the lead role. Old handbill of the vintage Hollywood movie Stand By for Action (1942) for sale. This is an actual surviving original vintage handbill of the 1942 war film that starred Robert Taylor in the lead role. Printed and circulated during the original first release run of the film in India (early 1940s), this vintage handbill for sale was actually distributed outside a cinema hall that screened the film and possibly used as a flyer insert in local newspapers. This old movie handbill features a combination of both hand painted and photographic artwork. It was designed and printed for the promotion of the film at an Indian theater (Astor), where it was screened. The dates of release of the film are printed at the bottom of this old movie handbill. This old movie handbill has been graded ★ As Is due to a small missing piece on the top right hand corner. Barring this small missing piece there is no other damage to the paper and it is in excellent display condition. Very rare old handbill of the hit Hollywood movie, Bataan (1943) for sale. This is an actual surviving original vintage handbill of the 1943 war film that starred Robert Taylor in the lead role. Made by Metro-Goldwyn-Mayer, Bataan was a historic film based on the defense of the Bataan Peninsula during World War II. This old movie handbill features hand painted artwork and was designed and printed for the promotion of the film at an Indian theater (Regal), where it was screened. The dates of release of the film are printed at the bottom of this old movie handbill.